Published by Cyril Huze April 20th, 2016	in Customs, Editorial and Electrical. J.W. Speaker Corporation, a leading U.S.-based lighting firm specializing in innovative LED solutions for OEMs and the aftermarket. Last February I reported on J.W. 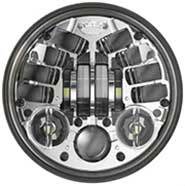 Speaker launching their the world’s first dynamically adaptive LED motorcycle headlight in a 7” round configuration. Consumer demand for this same adaptive technology in 5.75″ round size drove J.W. Speaker to develop the new Model 8690 A Series. The Model 8690 A Series headlight uses the same advanced electronics and on-board sensors as the Model 8790, enabling the headlight to carefully calculate bank angles and automatically control a light array to direct the light up or down as the motorcycle leans. As a result, the Model 8690 A Series headlight fills in the void of light to the left or right of the motorcycle, providing additional illumination and enhancing visibility while cornering. Heavy-duty, die-cast aluminum housing and state-of-the-art LEDs not only deliver premium performance, but also give a bike a truly unique look! The Model 8690 A Series utilizes high-quality LEDs, proprietary optics and adaptive technology to produce a superior beam pattern. Made in the USA. “We appreciate our motorcycle customers and could not be more excited to give them a quality product, offering enhanced visibility and added safety as they hit the road this summer,” said Kurt Kaufmann, Motorcycle Market Sales Manager at J.W. Speaker. For more information, contact go to J.W. Speaker or call 800.558.7288. Interesting concept. At $420 for the 5″ and $800 US for the 7″, it’s going to take a lot for me to want this enough. I tell my customers that it is expensive but if it prevents an accident then it becomes very cheap. 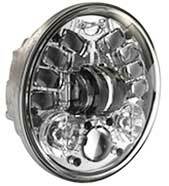 Brian J, the 8690 (No ‘A’) is the $420 5-3/4″ headlight and, though it looks the same as the ‘A’ version, is not Adaptive. The 8690A, the 5-3/4″ with the Adaptive technology, sells for $700. The choice is yours to spend the additional on the Adaptive technology. R&D costs $$… Wait for the overseas knockoff,they usually last a full season…….. I purchased one of the 8690M series from Dennis Kirk 3 weeks ago. It throws an amazing amount of light. How much, I measured 12600 lux at one meter for the low beam and 52800 lux for the high beam. 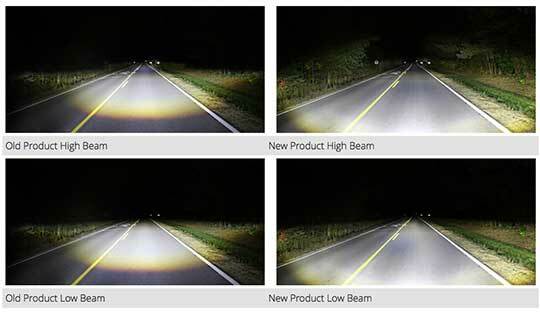 The low beam beats manufacturer ratings. There is ample light above the horizon just like the old halogen lamps too. No sharp cut-off beam like previous led lights or hid kits. I don’t have to worry anymore about deer when cruising interstate route 10 in Texas at the posted 80 mph speed limit. Night riding is safe and fun again.